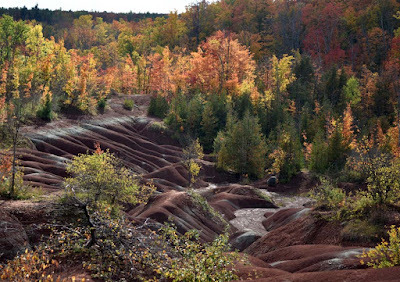 The red hills in Caledon have been partially freed, now they are allowed visitors at the edge, looking into the cage. 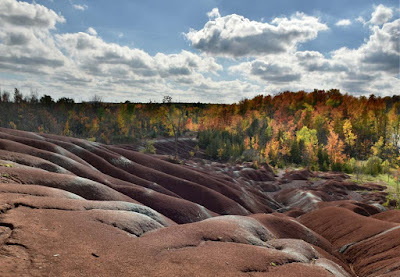 Where once the people roamed freely over the rolling ridges, the authorities shut down nature and fenced in the badlands, too bad they said, must keep people away. The area is owned by the Ontario Heritage Foundation and controlled by the Bruce Trail Association. 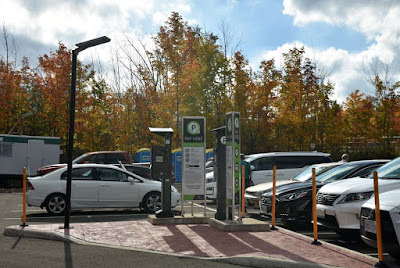 To protect nature they paved over a big chunk of it and put in a new 33-spot parking lot, guarded by a gate and charging a flat rate of $10 parking, every day of the week, from 8am to 7pm. 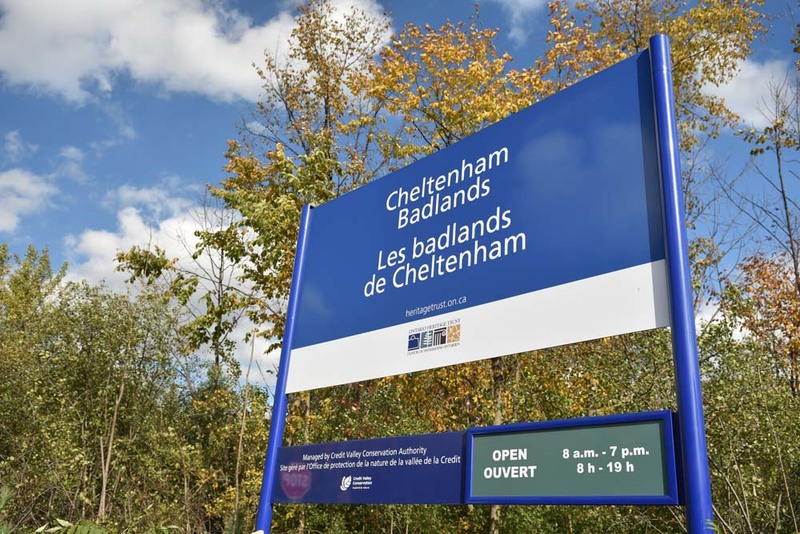 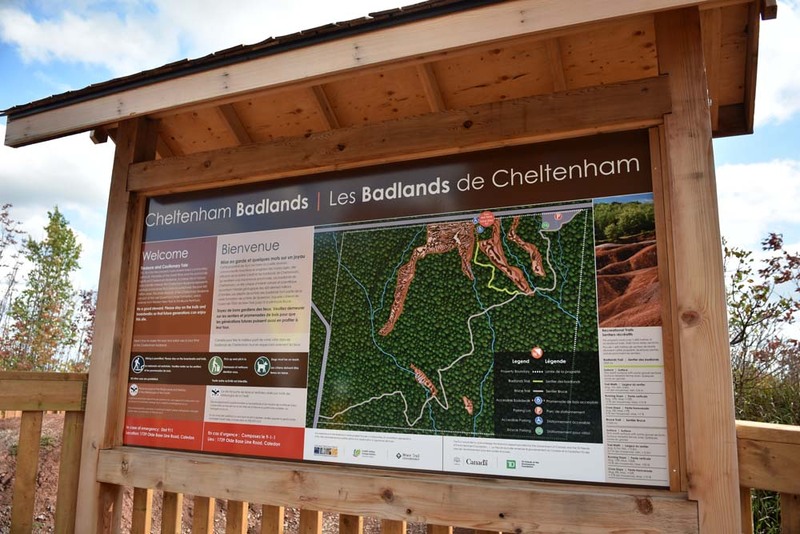 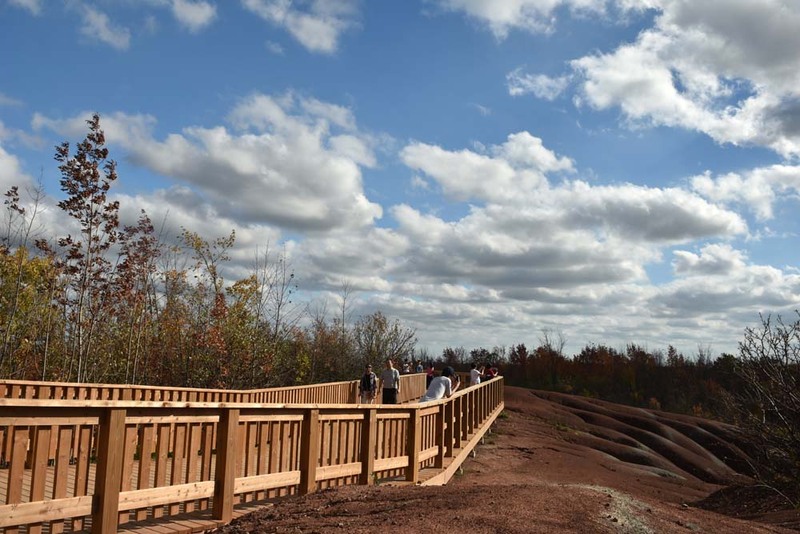 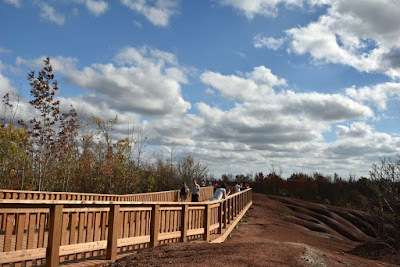 You can walk along the Olde Base Line Road sidewalk from the parking lot to the Cheltenham Badlands where you can find the boardwalk located at the top edge, looking down over the hills eroded by the elements. 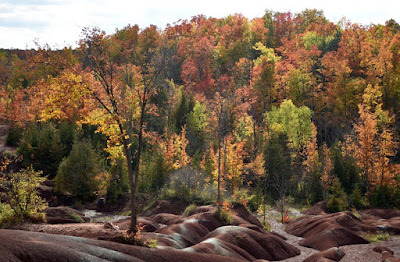 When the hills are wet the soils becomes darker. Also, no drones (without a permit) are allowed. 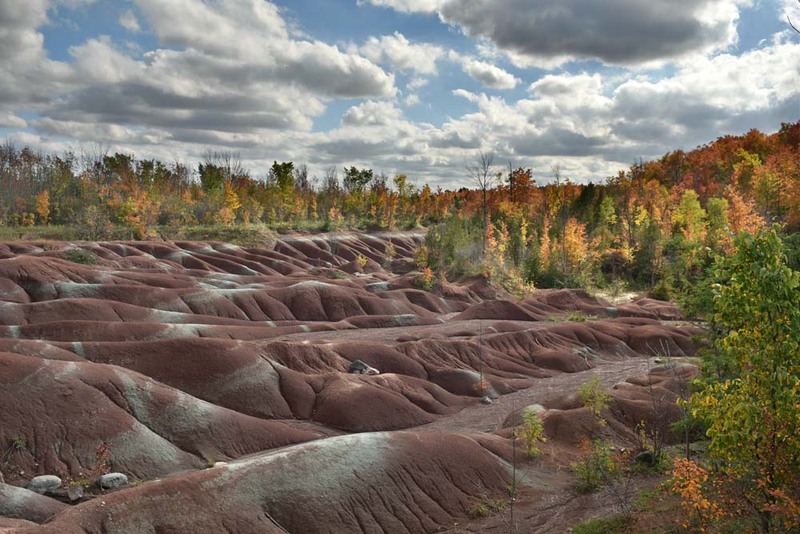 Mississauga Road. 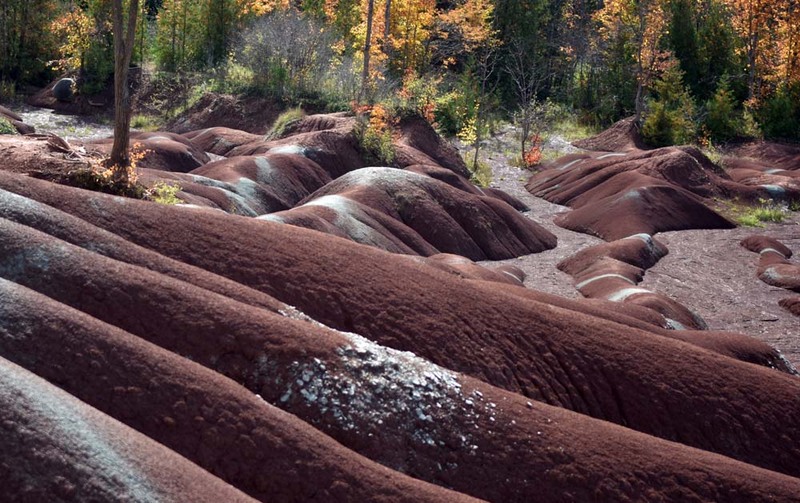 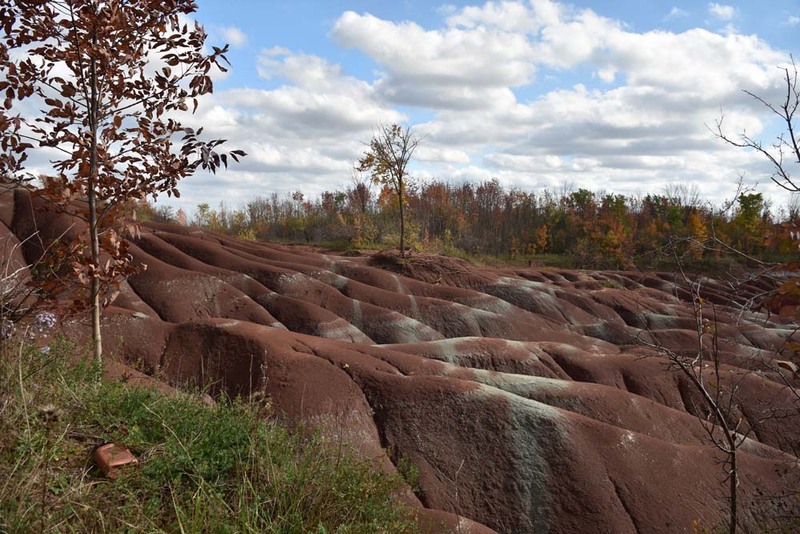 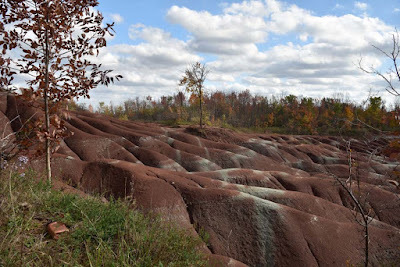 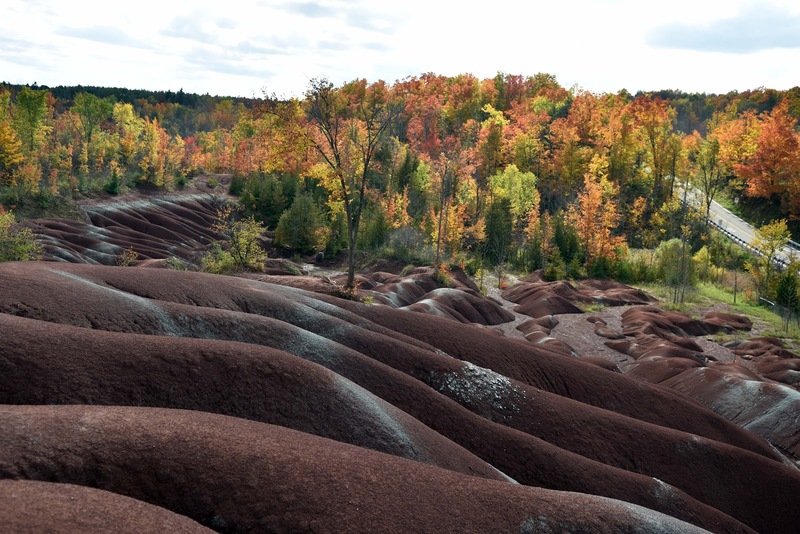 The area, stripped of grass and soil now consist of the gullies and mounds, red from the iron oxide in the Queenston Shale and with bands of greenish, white bands of the iron oxide. In fall, with bright sun and clouds in the sky, the hills and surrounding forest are spectacularly beautiful. 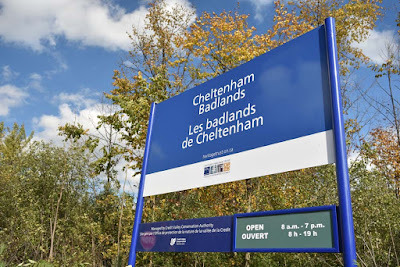 In winter the hills are closed from the end of October to May, for now they are open seven days a week. 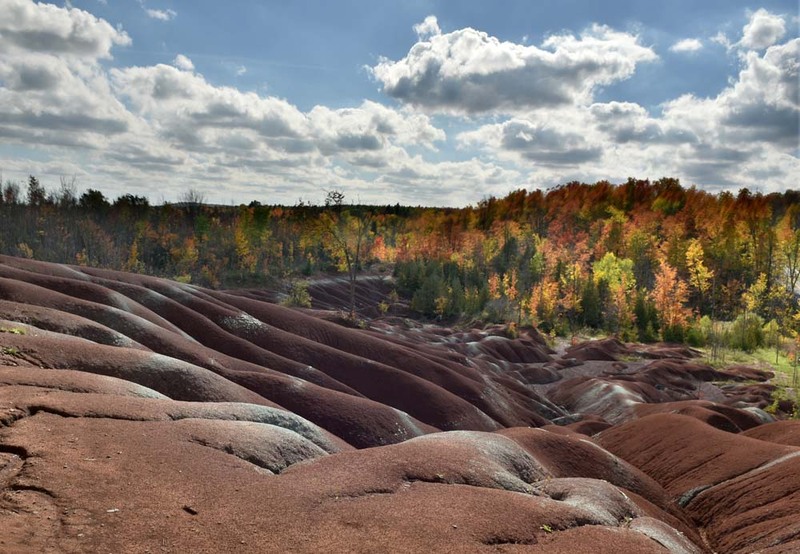 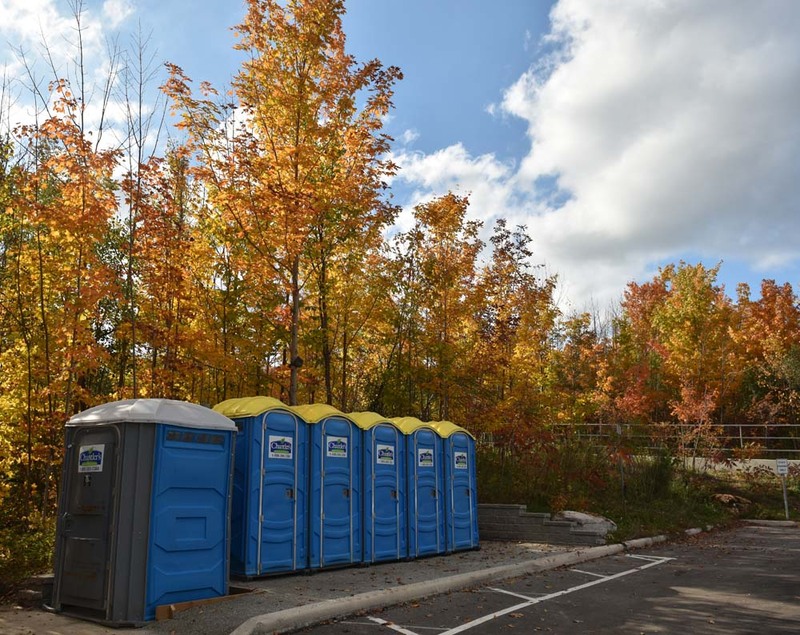 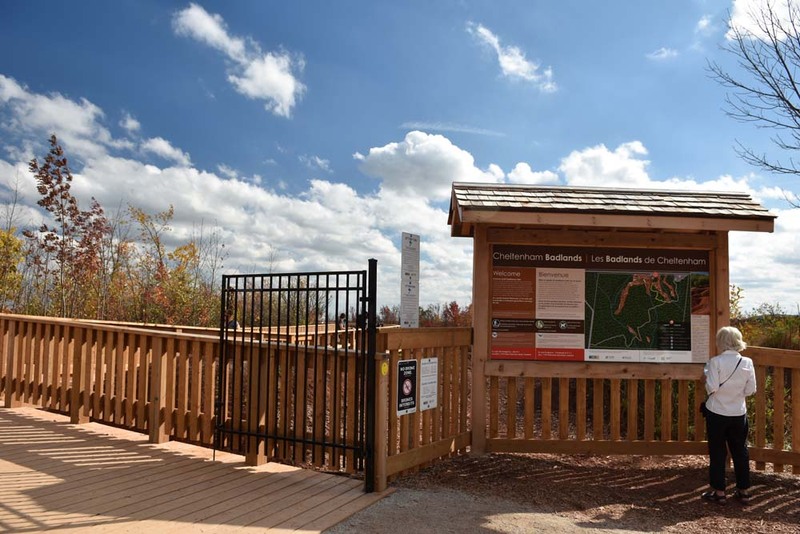 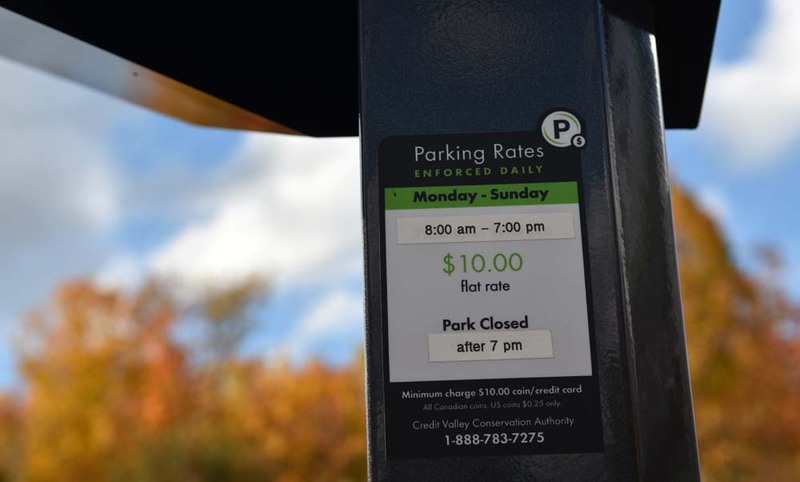 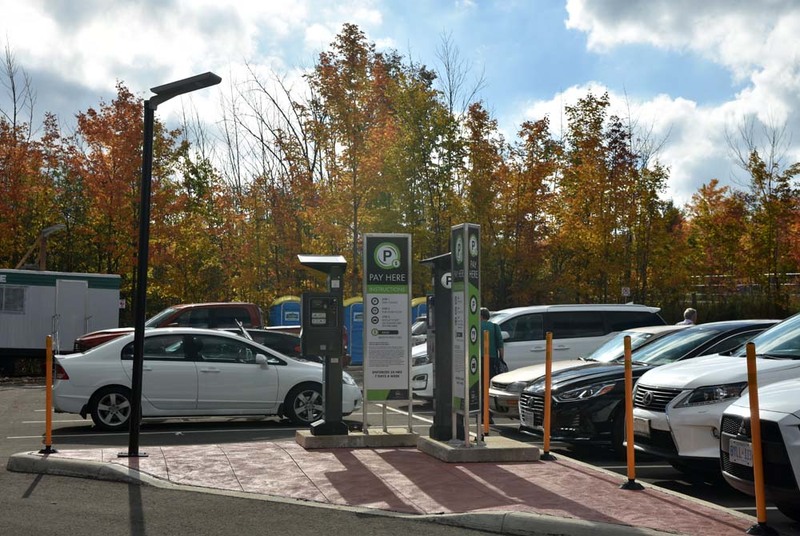 During weekends, especially with Fall colours, they recommend that you use the shuttle service which runs from 9am to 4:30pm, every 20-30 minutes from the Terra Cotta Conservation area. 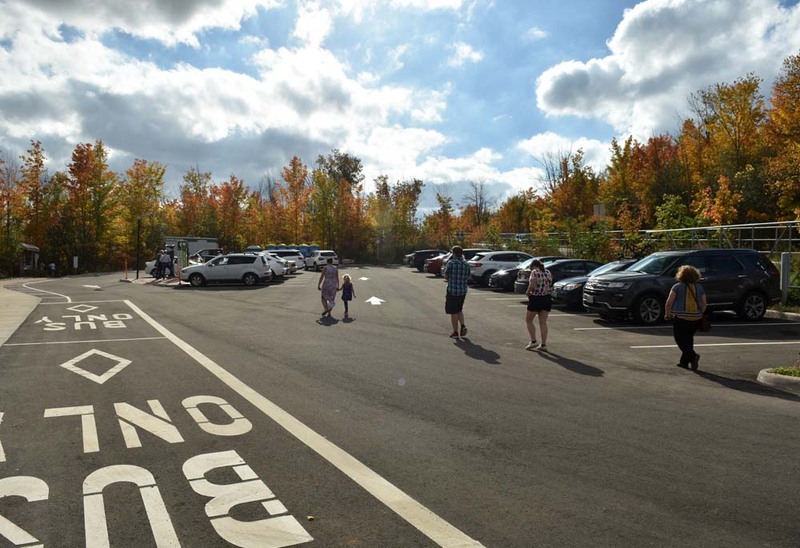 Cost for the shuttle is based on entrance to Terra Cotta, which is currently at $6 per adult and $8.99 during CVC Fall Fest, so after your shuttle you can take in the park. See more of the badlands after the jump.